Screw-driven oil press machine used to extract oil from seeds and kernels for edible or biofuel purposes. Semi-automatic oil expeller press combines motor,vacuum filter,heater and electric control cabinet in one machine. Customized oil refinery solutions for various vegetable seeds from 1TPD to 20TPD. What vegetable seed can your oil press machine process? 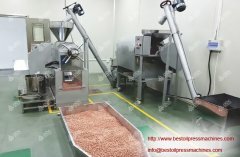 Our oil expeller machine can process a wide range of plant seeds such as peanut, soybean, sunflower seeds, sesame seed, cottonseed, rapeseeds, corn germ, coconut, palm kernel, jatropha seed, hemp seed etc. ... How does your oil press work? The seed is placed into the feeder either by labor or by conveyor. Then through the huge pressure or violent motion in the closed press, the original structure of oil seeds will be broken and a series of changes happened inside. Finally the oil is expressed out of the seeds What can I do with the crushed oil cakes?